In 2009 we started and headed the campaign to reform the law surrounding parental relocation of children following separation and divorce. Prior to our campaign, 90% of applications by a child’s primary carer to emigrate with the children would see the child remo ved abroad. Child welfare was not the court’s paramount consideration, nor the importance of the child’s other relationships, beyond that of the primary carer. Scant regard was paid to the bond between the child and their other parent, or the harm caused by severing or diminishing that bond. Trumping those considerations was the view that the primary carer’s distress (at the court saying “no” to relocation) would leave them psychologically incapable of caring adequately for their children. These principles had been set out in the case Poel v Poel, and confirmed in the case Payne v Payne  EWCA Civ 166. In 2007, in a case which today would have seen leave to remove refused, counsel told me outside the court that there was no prospect of the judge refusing the mother’s application, as the judge had had her last case overturned on appeal and if he even mentioned appealing the decision, she’d “kick him around the court”. There was a culture that such cases were doomed to failure. The principle being that the court would not unreasonably interfere with where the primary carer wished to live, even if it was 13,000 miles away. The impact of relocation on the child, a change in schools, removal often from both sets of grandparents and the wider family, removal from their other parent and the significant disruption to contact, and the welfare checklist were secondary considerations. 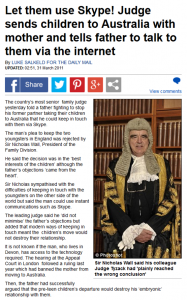 If a judge went against the trend and the relocating parent appealed, the appeal court would overturn the decision. Situations were made harder in that (the curiously named Access to Justice Act 1999) included provision (at section 54.4) that when the Court of Appeal refused permission to appeal (as routinely happened), you could not take matters to the Supreme Court. Critical of what was happening in the courts, we produced a Parliamentary Briefing Report, explaining how the court was routinely ignoring child welfare in such cases and we providing social and psychological research to underpin our arguments that the decisions of the court were harming child welfare. This was presented at Westminster in 2010 (reported in Family Law Week). We were joined in the campaign by a number of charities and individuals, notably Families Need Fathers, JUMP, Grandparents As Parents, and the Find Savanah-Jade Campaign Group. “I can hardly read the literature on Family Law without simultaneous feelings of an awful sadness and profound rage. Sadness at what has been done to our children and their families and deep rage for our Family Courts and the inadequate practitioners that work within it. In the near future the Family Law under which we endure will be seen as barbaric, criminally damaging, abusive, neglectful, harmful to society, the family, the parents and the children in whose name it purports to act. It is beyond scrutiny or criticism and like a secret society its members – the judges, lawyers, social and child “care” agencies behave like any closed vested interest and protect each others’ backs. The court is entirely informed by outdated social engineering models and contemporary attitudes rather than fact, preced ent rather than common sense and modish unproven nostrums rather than present day realities. It is a disgraceful mess. A farrago of cod professionalism and faux concern largely predicated on nonsensical social guff, mumbo-jumbo and psycho-babble. Dangling at the other end of this are the lives of thousands of British children and their families. Here is one more report that empirically nails the obvious fact that to remove a child from their father (in the hugely vast majority of cases), their grandparents and other family, their school and friends, is wholly destructive to a child and its family. 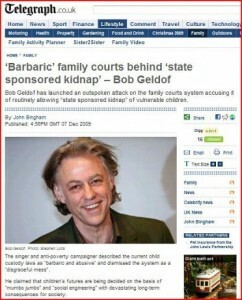 How much longer must we put up with the state sanctioned kidnap of our most vulnerable? Because in effect that’s what “Leave to Remove” amounts to. How much longer do we tolerate the vested interest intransigence of the appalling U.K. Family Justice system? How long before just one of them admit they have got it ALL wrong and apologise to their myriad victims? This report is important, timely and vital. To accept its findings, which could have and should have, been conducted at any time in the past 30 years, is to accept the awful conclusion that rather than Solomon like resolving our tragically human disputes with understanding, compassion and logical pragmatism the courts have consistently acted against society’s interest through the application of prejudice, gender bias and awful impartial cruelty. This report proves it. May God forgive them. I won’t. In a case we helped with, Sir Nicholas Wall accepted the arguments for a reform of the law as ‘compelling’, yet still allowed yet another leave to remove case to go ahead (D (Children)  EWCA Civ 50)). A newly appointed High Court Judge, Mostyn J, spoke out and contradicted the Lord Justices of Appeal, saying there was an urgent need to reform the law (in AR (A Child: Relocation)  EWHC 1346 (Fam)). Yet still senior judiciary resisted, and a review was stalled. 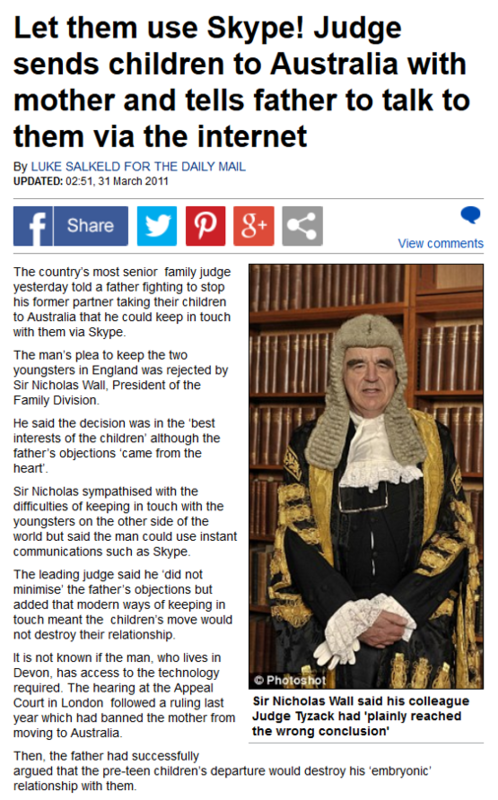 Sir Nicholas Wall (the then President of the Family Court) had stated to me publicly at a charity conference in Birmingham that Payne v Payne would not be reviewed. He stated it could not, as only a more senior court could review the decision. The review could only happen in the Supreme Court, but refusal of appeals blocked this approach. Lord Justice Thorpe shared that view, albeit later went on Radio 4 to say that there was an argument for a review to happen. Finally, the review came in the case K (Children)  EWCA Civ 793. 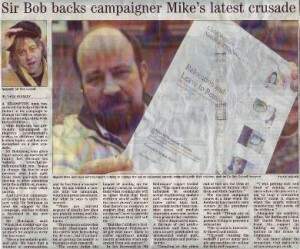 The review which we’d been told could not happen in the Court of Appeal, did! It was headed by Lord Justice Moore-Bick, the second most senior judge in the Civil Court. He concluded that the only principle of law in the current guidance was that a child’s best interests were the court’s paramount consideration. Payne v Payne was no longer binding precedent, and in his opinion, never had been. In our and the legal profession’s opinion and experience (see above), it most certainly had. Regardless, finally, after 40 years of protest by others, the lower courts were no longer forced to follow archaic guidance. Have things changed subsequently for parents involved in relocation cases? Yes, absolutely. Prior to the Re K ruling, another leave to remove case presided over by Sir Nicholas Wall had made headlines… “Let them use Skype!“. In 2015, a more enlightened and modern judiciary take a more modern and child focused view… in the case R (A Child: Relocation)  EWHC 456 (Fam), came the ruling “You can’t hug Skype!” How things have changed! Through the ruling in Re K, the lower courts have been liberated to exercise their discretion. Since late 2011, we’ve seen continued improvement, and particularly in the past two years with some spectacular decisions in the High Court and Court of Appeal, as a new generation of judiciary step forward, and as the old guard retired. For parents seeking to defend against a leave to remove application, we have guides and detailed case law libraries (both for permanent and temporary removal from the jurisdiction). Things have changed, and defending against these applications is no longer the hopeless task it was.